A versatile rope winch, for anchoring, sailing and fishing. Features include all aluminum housing wi..
Retrieval speed up to 85'/minute. Housing is durable aluminum with triple finish nylon coating. Excl..
Retrieval speed up to 80'/minute. Free fall design is up to 6 times faster than powering down. Housi.. This switch to be installed at the helm or wherever you choose, provides a second option for control.. 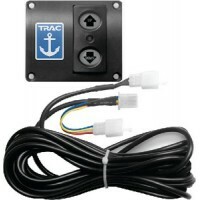 Compact remote control allows push-button anchor operation from any location. A snap-in case can be .. Suitable for applications requiring heavier anchors, up to 35 lbs. Ideal for pontoon boats of all si..
Vetus, Ajax 10Mm Electric Windlass 24 Volt, VT AJAX2410..
Vetus, Alexander Iii Electric Anchor Windlass, ALEX31210..
Vetus, Anchor Control Panel, AWPANEL..
Vetus, Dual Make/Break Relay, AFST1512D..
Vetus, Dual Relay 12 Volt 1500 Watt, SOL1512D..
Vetus, Extra Transmitter For Remote Control, REMCO..
Vetus, Hand Held Remote Control, RECON..
Vetus, Napoleon 12 Volt Gipsy 8 Mm Din 766 Iso4565 5, NP1208D..
Vetus, Napoleon 12 Volt Gipsy 10 Mm Din 766 3/8" Bbb, NP1210D..
Vetus, Push Button Switch Excluding Relay, AFSTPB..
Vetus, Single Relay 12V/1500W M6 Terminals, SOL1512S..
Vetus, Windlass Alexander Iii 10Mm, ALEX32410..
Vetus, Windlass Alexander Iii 8 Mm, ALEX32408..
Vetus, Windlass Alexander Iii 8Mm Electric, ALEX31208..
Vetus, Windlass Anchor Chain 8Mm, CHAIN0830..
Vetus, Windlass Anchor Chain 8Mm, CHAIN0850..